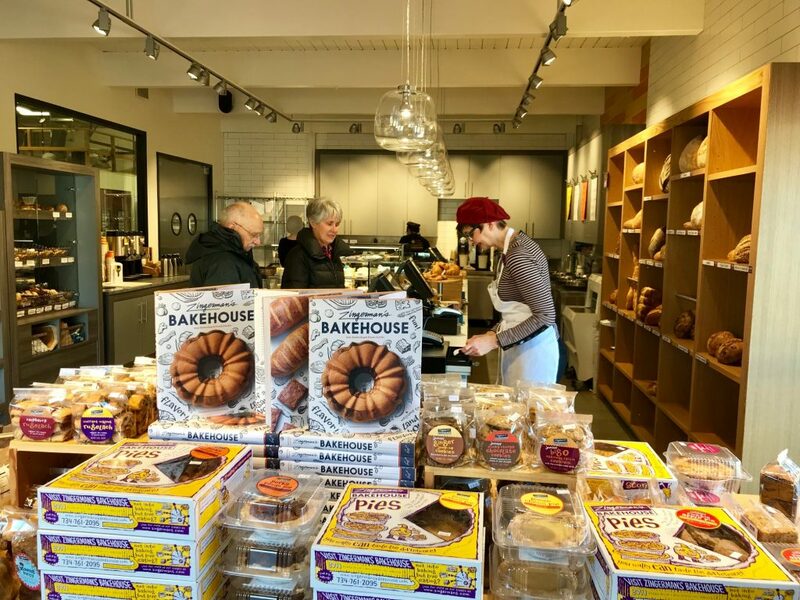 The Bake Shop is our bakery retail store here at Zingerman’s Bakehouse. We serve all that Zingerman’s Bakehouse has to offer: artisan bread, tasty pastries, crusty bagels, delightful cakes, and our own soups and sandwiches. You can peek through our bakery window to see the Zingerman’s bread bakers in action. Enjoy bread fresh from the oven through out the day, our friendly knowledgeable staff, free smells, free samples, and free convenient parking. Stop in and visit us! We’re located near the Ann Arbor Airport and Costco. Hope to see you soon. Use the I-94 exit at State Street (#177). Go South on State Street (away from downtown Ann Arbor): this is a left turn if you are coming from the East and a right turn if you are coming from the West. Next turn right on Airport Boulevard. Follow Airport Boulevard as it curves and turn right on Plaza Drive. Zingerman’s Bakehouse is the fourth building on the left (3711 Plaza Drive). It is the one with an orange roof. Follow your nose to that great bakery smell! You’ll see the back of our building first, so continue around to the front side. The first door is marked “office” the last door is marked “Bake Shop,” this is where you’ll find our retail store! You’ll see a sign on the sidewalk at the Bake Shop entrance.